Smith, Cameron M., Haslett, John F.
A survival guide for extreme situations provides information and field-tested techniques for surviving such emergencies as being adrift on a life raft, lost in the woods, or bitten by a snake. Part I: Stayin Alive: Basic Wilderness Survival Principles. Chapter 1: Surviving the Wilderness. Chapter 2: Preparing Yourself for a Survival Situation. Chapter 3: The Psychology of Survival: Gaining the Upper Hand. Chapter 4: Survival Style: Keeping Warm or Cool. Chapter 5: Making Fire in the Wilderness. Chapter 6: Home, Sweet Hut: Survival Shelters. Chapter 7: Liquid Capital: Finding Drinking Water. Chapter 8: Gathering and Hunting to Stay Alive in the Wilderness. Part II: Eyeing Advanced Survival Techniques. Chapter 9: Finding Your Way with Tools: Basic Wilderness Navigation. Chapter 10: Looking Up to the Skies: Celestial Navigation. Chapter 11: Trekking over Land. Chapter 12: Signaling for Rescue. Chapter 13: Administering First Aid. Chapter 14: Survive or Thrive? Advanced Methods and Tools. Part III: Surviving in Extreme Land Environments. Chapter 15: Special Considerations for Forests and Jungles. Chapter 16: The Big Chill: Enduring in Snowy Places. Chapter 17: Staying Alive under the Sun. Part IV: Surviving on the Seas, Oceans, and Great Lakes. Chapter 18: Staying Afloat and Warm. Chapter 19: The Great Drift: Aboard Life Rafts and Disabled Vessels. Chapter 20: Food and Drink at Sea. Chapter 21: Emergency Travel and Navigation at Sea. Chapter 22: First Aid on the Water. 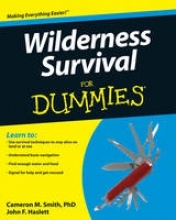 Chapter 23: Ten Ways to Practice Wilderness Survival Skills. Chapter 24: Ten Quick Escapes.